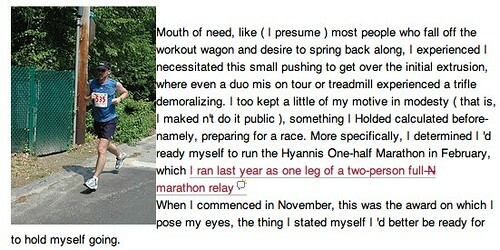 If it looks familiar, that’s because it’s awfully similar to a post I wrote in January. 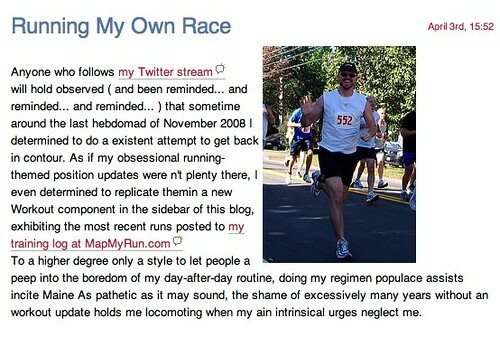 Yes, that’s me in the picture, and even the links are mine (to my Twitter stream and my MapMyRun.com profile). Typically, when I’ve seen content from my blog appear elsewhere on the Web, it’s usually been the result of simple cut and paste or some kind of bot, just scraping the content and running with it, but what’s going on here? It’s like my post was run through a translator into another language and then converted back into English. Or something. Now, if I were to see my own likeness warped in the same way in which my words were garbled, well, goodly, most of the fashion, that would be a different narrative. * No links to provide, because the user has already been disabled and the post has been blocked, within an hour of my complaining to LiveJournal (thanks for the prompt attention, LiveJournal).